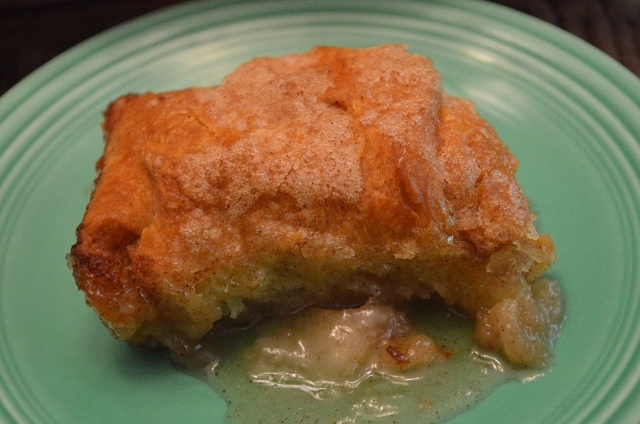 Since I live in an area where apple dumplings are taken fairly seriously with apple dumpling festivals and apple dumpling queens, I hesitate to call this recipe apple dumplings since it is not the traditional apple and crust. This is a recipe I got at a family reunion and like a lot of “family reunion food” is is neither low fat nor low sugar – but it is good! I am including the recipe as it was written but when I make it again, I will probably reduce the butter by 1/2 cup and the same with the sugar. You can also substitute margarine for half of the butter. I don’t know what function the Sprite (or Mt. Dew) serves on the top other than moisture – one of the mystery recipes that makes it way through families. Peel, core and cut each apple into 8 wedges. Place one apple wedge in each triangle of the crescent roll dough. Roll up from the large end to the small end. Place in a 9 x 13 glass baking dish. Continue with the other apple wedges and dough triangles. Melt butter in a small sauce pan. Mix with sugar and cinnamon, pour over dumplings. Pour Mountain Dew or Sprite over all. Bake 45 minutes at 325 degrees. Eat and enjoy! Love, love apple recipes in the fall and these look SO delicious. thanks Mary. Thanks, love the smell of apples baking. Anything baked with apples is always good! A great recipe I can’t wait to try out. I love apples and cinnamon, and especially dumplings! 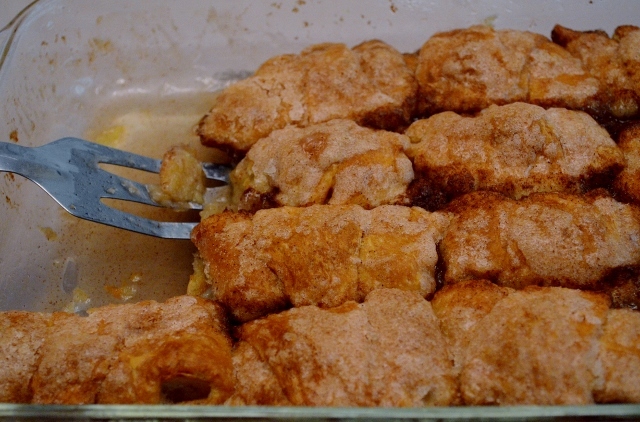 I came up with a related recipe for Apple Dumplings in a cinnamon sauce. While different from your own, I think mine is a unique take on the dish. I’m new to the Food Blog scene and would love some feedback from a pro like you. Check out my recipe if have time. Thanks for the comment and I will take a look at your blog. Always looking for good recipes!